August and September are such pivotal months. The kids go back to school, so your schedule completely changes. Football season starts. The weather cools. Christmas decorations go up at the stores…..GAHHHHH! ....PANIC! It just seems like a downhill, whirlwind slide into December from here. Fortunately, this is the best time to whip out your pressure cooker to help make your schedule a little less stressful. Pressure cooking can take a slow-cooked main course that would normally take hours to cook on a Sunday afternoon, to being able to cook the same meal in under an hour during the workweek. Slow-cooked dishes like soups, stews, pot roasts, bean dishes, chili, sauces, you name it, can be all be prepared during the week with a pressure cooker. In addition, the cold, dark fall and winter evenings simply beg for a hearty slow-cooked meal. Today, I am making Curry in a Hurry from Lorna Sass’ book Pressure Perfect. I mentioned before that if you are looking for a good pressure cooking cookbook, this is it. As mentioned in this recipe’s description, it’s almost too easy and too good to be true, so let’s warm up with some curry shall we? 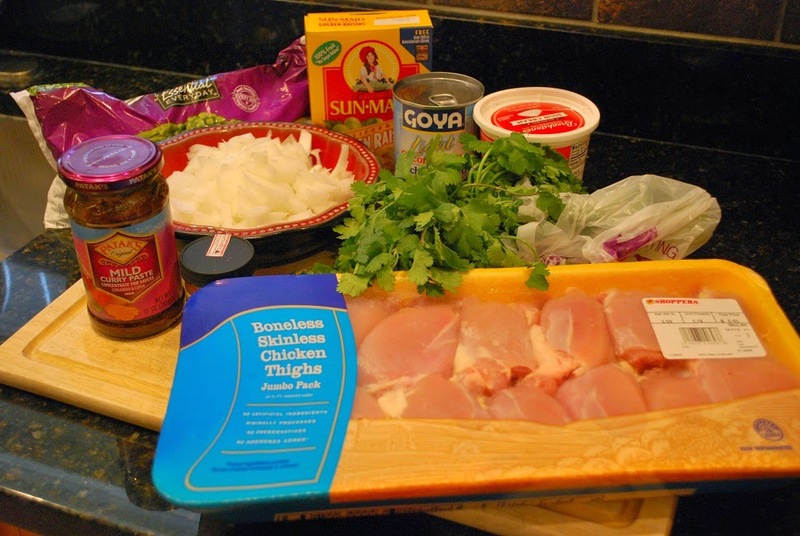 NOTE: I am using boneless, skinless chicken thighs for this recipe; however, Lorna says you can substitute for 3 lbs of bone-in, skinless chicken thighs, OR 2 lbs of boneless pork shoulder, trimmed and cut into 1-inch pieces, OR 2 lbs boneless beef chuck, trimmed and cut into 1-inch pieces, OR 2 lbs of boneless lamb shoulder, trimmed and cut into 1-inch pieces. 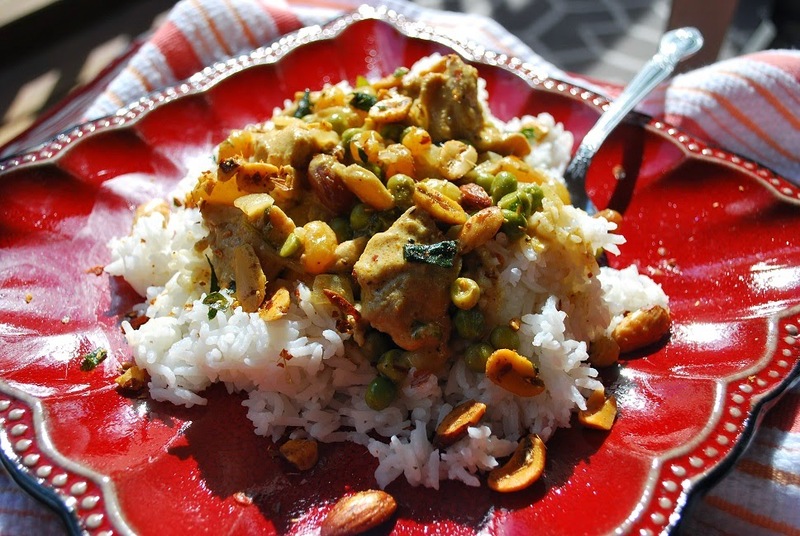 Pour the water or coconut milk into a 4-quart or larger cooker and blend in the curry paste. Set over high heat and add the onion and chicken. Lock the lid in place, set the heat to high, and bring your cooker to pressure. When at pressure, lower the heat to med/low, and time to cook for 8-10 minutes (for lamb 12 minutes). After cooking for 8-10 minutes, move the cooker to a cool burner and allow the cooker to depressurize naturally for 4 minutes, then do a manual pressure release (if using other kinds of meat, allow to depressurize completely. Do not do a manual release). Remove the lid, tilting it away from you to allow steam to escape. Place cooker back on a burner and bring to a low simmer. If necessary, skim off any fat that rises to the surface. Blend the cornstarch and yogurt into 1 cup of the broth, and then add to the meat in the cooker (Note: avoid cooking yogurt under pressure as it tends to sink to the bottom of the cooker and scorch). Stir until thickened. Add the peas to the meat and simmer for 1 minute. Stir in the cilantro and salt to taste. Serve with cooked, jasmine rice. Toast one or more of the following spices and stir into the curry with the yogurt: 1 T black mustard seeds, 1 tsp whole fennel seeds, and 1 tsp of whole cumin seeds. Vegetarian version: Scrub or peel 1 ½ lbs of potatoes and cut into 2 inch chunks. Prepare in the same manner except there is no need to allow time for natural depressurization; you may depressurize manually.